Fender welt roll for the 1928-31 Model A Ford. This is the 3/16 grained dull black vinyl beading for putting the fenders on. Made in USA. 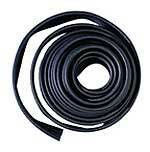 The 1/8" Black vinyl bead that fits between the gas tank and cowl section. Originally was painted bottom body color. 1928-31 Frame Welt 18' Roll. 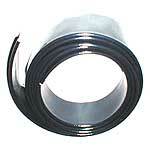 Correct 1/16 x 1 3/4" dark brown welting that is treated to prevent rot. 18 feet for complete body to frame. The frame welting should be extended from the front of the frame horns and continue back to about a half inch beyond the running board splash apron. This woven fabric welt is used as a buffer around the gas tank to eliminate squeaks. The 1928-29 models use it all the way around the tank and the 1930-31 models on the front and back edges. Length 9ft. Fits all except 1928-29 four door sedan. Length 12ft. enough for the 1928-29 four door sedan. Body block pad set for the 1928-29 Model A Ford. These rubber pads were nailed to the body mounting blocks to align the doors and the hood. Body block pad set for the 1930-31 Model A Ford. Body mount block set for the 1928-29 Coupe, Roadster, or Phaeton. This is a complete set of good quality hardwood blocks that go between the sub rails and the frame. Body mount block set for the 1928-29 Model A pickup or AA truck. Body mount block set for the 1928-29 Model A Tudor Sedan. Body mount block set for the 1930-31 Model A pickup and AA truck. Body mount block set for the 1930-31 Model A Coupe, Roadster, or Phaeton. Body mount block set for the 1930-31 Model A Tudor Sedan. Body mount block set for the 1931 Model A Slant Windshield 4-door. Many of the 4-doors and other cars had wooden sub rails instead of steel. They don't use the body mounting blocks. This is the set of round rubber shims used under the front of the cowl to align the doors and hood. These are the steel washers with the square hole, which are used where the body bolts pass through the wood sub rails on cars and pickups. Sold each. These are the steel washers with the round hole, which are used where the body bolts pass through the wood sub rails on cars and pickups. Sold each. This is a complete set of bolts to mount the Model A Ford body to the frame. Frame horns 1928-31. If the front of your frame got in a fight with another car and lost! These will fix it. Sold in pairs and you will have to put holes in them. Made in USA. Body mount Bracket 1928-31. This is the bracket that is riveted to the frame rail, and the front of the body mounts to it. Made in USA. These rivets are used to attach A-5075 body brackets and A-5100 Hood Handle Brackets to the frame. 4 per set, 5/16" x 5/8" round head. Pan Under Front Seat for the 1928-29 Model A Ford. Fits: Coupe, Roadster, Roadster pickup and Phaeton. Under Seat Panel for the 1928-29 Closed Cab pickup. This panel goes under the seat riser, and serves as a floorpan. Pan Under Front Seat 1930-31. Goes under seat riser in front. Made in USA. Fits: Coupe. Pan Under Front Seat 1928-29. Goes under seat riser in front. Made in USA. Fits: 4-door sedan.. Under Seat Pan 1931. This pan is for the 68-C Cabriolet, Slant Windshield 4-dr, and the late 31 Coupe. 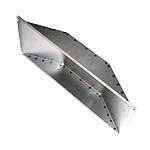 It is 2-1/2" deep, and measures 11-1/2 x 27-1/2". Under front seat. Made in USA. Riser Hump 1928-31. This dye stamped hump was spot welded in the rear seat riser of Tudor Sedans and 4-door Sedans. Made in USA. Cover Framework 1930-31. 1931 Slant windshield 4-door, 1930-31 Vicky & A400 used a piece of canvas under the rear seat to cover where the rear cross member stuck through the floor of the body. This is a set of the metal retaining strips that held the canvas to the floor pan. Made in USA.